1:15 appointment for a check-up at the office we usually don't go to. Doctors these days usually have multiple offices and depending on the day of the appointment determines where you go. So.. here we are. 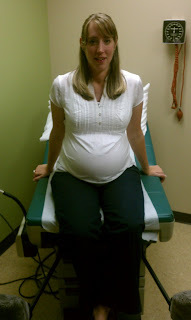 We're at the point of the pregnancy where we'll have appointments every 2 weeks. That means we're getting close to the time that I get to see my little princesses. I'm sitting in the lobby of the doctor's office waiting on Mommy to arrive. Have you noticed this trend yet? Mommy is always late. That's ok though. She's worth waiting for. If Audrey and Bailey are like Karyn, they won't be delivered until June. My wife finally arrived and we headed up to the office. This waiting room is much smaller than the other office. Less people too. It looks like an older crowd too. Not too many expecting mothers. Unless they're expecting grandmothers. Hope not. Eww. Karyn picks up the first magazine she finds. It's called "AKA Mom". I need to buy her a subscription to "AKA Always Late" but I digress. While she reads, I type. It's what we do. I feel like I should be mayor of the OBGYN waiting room by now. We sit here, hearing name after name being called, waiting to hear the magic words; "Karyn Smith". We finally do. They call us back, weigh my bride, give her a cup for the pee sample, and sit me in a room. The room is tiny and the stirrups take up a lot of space. Hopefully we won't need the stirrups today because where I'm sitting would be awkward. No 3-D glasses would be needed if you know what I mean. They told us that she's gained about 15 lbs since the 1st visit. They checked her blood pressure and it was good. Glad they didn't check mine. I'm a little on edge today from lack of sleep. She joins me in the room and takes her usual spot on the exam table. The doctor comes in shortly after. We listen to their heartbeats. They sound great! Karyn had mentioned to me that Bailey switched positions. The doctor confirmed it by touch. We'll see for ourselves at the next ultrasound. Everything is going as expected. The doctor asked Karyn if she's been keeping track of contractions. She said no. He wants her to. She won't. That's the only way to tell if she's going into early labor and we want the babies to stay put as long as possible. The doctor said we're at a critical time. Some twins come at 30 weeks. Every 2 weeks that she makes it after this point is a blessing. Our next appointment is December 7th. We'll have an ultrasound and get to see Daddy's princesses. To my little angels: I talk to you every night and I already give you lots of kisses. I've been saying your bedtime prayers with you. I can't wait to hold and kiss you. Stay in Mommy's belly as long as you can so you'll grow good and strong. Besides, your brothers are waiting on you and they can be quite rowdy. Be easy with Mommy. You guys have been kicking her hard. I know this because when she has her belly against me, I can feel the kicks too! It's really cool, actually. I love you more than I could ever say. Hugs and kisses from Daddy. Xoxoxo.